Matching Speaker Cabinet: 4x 12"
A popular bundle including Marshall JVM410H and 1960AV (Vintage30), as well as a high-value Klotz speaker cable. 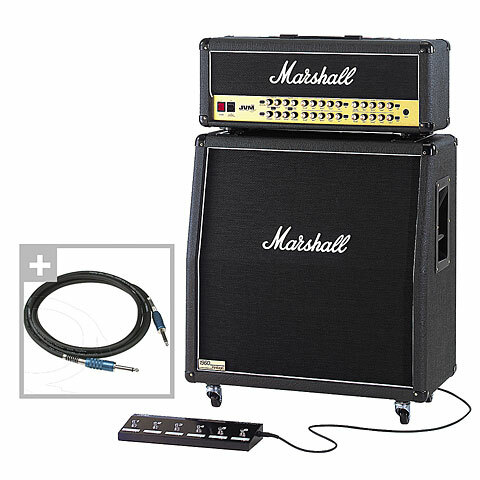 The Marshall JVM410H is a high-tech all-tube amp and sets a new benchmark in terms of guitar amplification. The concept provides twelve separate fundamental sound circuits in four channels. In spite of the enormous possibilities, this 100 Watt amp doesn't have a single semi-conductor in the signal path which makes these amps dynamic and makes 100% profit of the qualities of real tube amplification. For each existing sound mode (three per channel) the major switching relay functions (ie reverb, effects and master volume dial) can be freely stored and can be driven simultaneously from the supplied 6-switch footswitch. The footswitch can be thereby individually configured by the user and also stored. This incredibly comfortable Stageboard is connected via a simple standard guitar cable of any length with the amp! Users of multi-effect devices can alternatively save every imaginable sound setup on 12 different MIDI locations and recall them at will. For the Marshall JVM410H Amp Head there is only one matching phrase: State of the Art! Because with all the possibilities offered by this Head to the user, no compromises have been made in sound quality. Marshalls technicians have provided the major relay functions (e.g. the choice of the appropriate 12 basic sounds and the master volume selection) easy to footswitch or MIDI recalling. Rather than succumb to the temptation of making any unnecessary controller positions storable. The only sound technical solution for this would namely motorised potentiometers which react unacceptably sluggish in practice. In terms of power amplifier technology, Marshall relies of course after many decades, on the EL34 configuration of the legendary 100 Watt JCM 00 Heads. Loudspeakers: 4 x 12 "
With the JVM amplifier series Marshall has the most versatile amps of all time in their product range up till now. Uncompromised tube technology in conjunction with a modern electronic control system enables an unimagined Sound variety. The sound repertoire includes the entire range of classic Marshall sounds from the last decades, coupled with the latest features such as digital reverb and a MIDI interface.